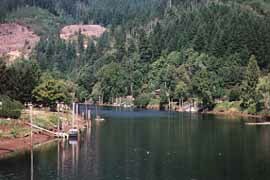 Once the head of navigation on the Siuslaw River, the community of Mapleton in Lane County lies some 15 miles upstream from Florence along Highway 126. The town site is also positioned at the Highway 36 junction within the Siuslaw National Forest. This community enjoys a generally warmer climate than Florence. Mapleton was thought to be named for its many big-leaf maples. Residents live along the river and in adjacent valleys, and the Mapleton Boat Ramp is a popular place during the salmon and steelhead runs. There is also a Mapleton, Iowa.